Every culture has its own version of a fry-up but few have it down to an artform like the Japanese. Light and crisp, with minimal oily residue, tempura is the king of batter. Time Out crunches their way through the best tempura in Hong Kong. The Inagiku guys have been whipping up quality tempura dishes in Japan and beyond for more than 100 years. We say the Inagiku Grande at the Four Seasons is a must-visit for any light batter lover. With stunning views of the harbour and a mix of traditional and modern Japanese art, this restaurant has an atmosphere like no other. 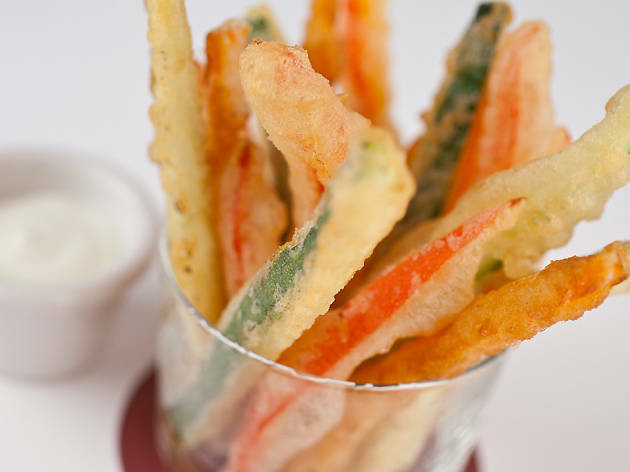 The tempura not only melts in your mouth but is crispy, flavourful and devoid of grease. Perhaps the secret sesame oil, imported from Japan, has something to do with it. 1/F, The Royal Garden, 69 Mody Rd, Tsim Sha Tsui, 2733 2933; rghk.com.hk. When it comes to popular tempura spots, Ippoh is ahead of the game. The team here keeps it simple by offering one tempura menu at lunch and only three tempura sets at dinner. The batter is airy in texture and perfectly crisp. With ingredients flown in daily from Tsukiji Market in Tokyo, you know you’re getting authentic and fresh dishes. Do make a reservation, though. We’ve heard tales of guests waiting for up to two months for a table (yikes!). 39 Aberdeen St, Central, 2468 0641; ippoh.com. With a two-page tempura dinner menu, Gin Sai has something to satisfy every craving. Ranging from Boston lobster to egg whites, you can stick with your favourites or try something new. Gin Sai offers counter seating so you can watch the diligent skills that are required to make these crispy fried dishes. Shop 3-7, G/F, The Oakhill, 32-38 Cross Ln, Wan Chai, 2574 1118; ginsai.com.hk. This dimly lit traditional Japanese-style restaurant not only has a raft of rave reviews to its name but it’s also recently received several awards. Best known for its eclectic range of crab dishes, Kanizen serves tempura that you won’t want to miss. With its light texture, the batter is fried to a tee, leaving it crunchy and anything but greasy. 3 Thomson Rd, Wan Chai, 2866 1618; kanizen.hk. Located at the luxurious Island Shangri-La in Pacific Place, Nadaman has some of the best quality tempura dishes in town. Split into separate dining areas, this elegant restaurant offers city views mixed with lush greenery, providing a peaceful dining atmosphere. Hailing from Japan, chef Takatsugu Koyama serves authentic, quality tempura that is crispy to the last bite. 7/F, Island Shangri-La Hong Kong, Pacific Place, 88 Queensway, Admiralty, 2820 8570; shangri-la.com. The only 360-degree revolving restaurant in Hong Kong offers stunning, one-of-a-kind views. With window seating only, you’ll capture the true beauty of Hong Kong, day or night. However, the Grand Buffet isn’t all beauty and no substance. The hot dishes are cooked to order right before your eyes, which is why the tempura here is just as you like it. Crisp, hot and full of incredible ingredients. Talk about a grand slam! 62/F, Hopewell Ctr, 183 Queen’s Rd E, Wan Chai, 2506 0888; thegrandbuffet.hk.